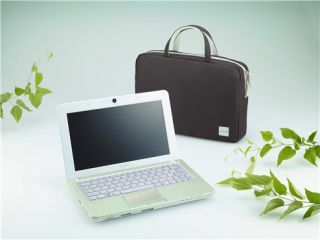 Sony's new laptop, the Vaio W, has been dubbed 'kinder to the environment' by the company, while not skimping on the specs. The new slimline notebook, with dimensions of 179.6 mm x 267.8 x 27.5-50.9, has a 10.1-inch screen with LED backlighting – some other firms might call this a netbook, but Sony has be vigorously distancing itself from this name. The Vaio W has a 250GB hard drive with an Intel Atom N450 processor, spouting 1.66GHz of power. It's also running Windows 7 Starter edition, and comes complete with your very own 1GB of RAM under the hood too. Other connectivity options include Wi-Fi to 802.11n standard, Bluetooth and a (presumably 1.3MP) webcam embedded. Sony is touting up to 8.5 hours battery life from the laptop, which will be released from February 2010. And to live up to the 'green' moniker, Sony is promising a Vaio W Eco Edition – which is essentially packaged in more 'responsible' plastic and has a mint green palm rest. However, the palm rest, top and bottom covers are also made from recycled materials, recovered from DVD manufacture. We're still yet to hear word on pricing, but we'd imagine the Eco edition would set you back a little more than the standard Vaio W series.